On this day in 1671 the Académie royale d’architecture was founded. One of several academies founded by the French to set down la pratique parfaite in virtually all fields–in other words, to codify the ideal Frenchness of everything dans le monde–the Royal Academy of Architecture had both specific goals and tremendously broad reach. As a training ground it ensured that properly educated and directed corps of designers could contribute to the great works to honor the great king, notably Versailles and the Louvre. But it did much more than ensure the beauty and consistency of seventeenth-century French architecture for the state; it became the core of Classical training in the grand tradition for generations of architects in France and, ultimately, far beyond its borders. De-royalized at the time of the Revolution, by the early nineteenth century the Academy was back in business as the Ecole des Beaux-Arts, the most successful and important architecture school and tradition ever, anywhere, in the universe. It brought together the traditions of the Classical world as they were first formed: guides to the identification and understanding and creation of beauty as well as the application of design principles within contemporary practice. It is the universal, timeless, truly modern way to design and build, and always has been, except for a brief interruption occasioend by a small blip of pestilence–a nasty, hard-to-shake virus still sadly lingering on–that brewed in 1920s Germany among the sorry, misguided followers of a poor ill soul who had lost his ear for the Muse. As a whole, the establishment of the academies may have been the high point of the Sun King’s reign. They are a part of a small but significant heritage of tasty patrons cut of royal cloth. A small club to be sure, but when they have an eye for beauty, there is no stopping them. And while we may cringe at the excesses and downright grossness of Louis and others in his fraternity–Nero and Napoleon III come quickly to mind–there’s no denying that imperial legacies are not all bad (just take a skipping romp through Early Christian Rome, sixth-century Byzantium, the eigth-century Frankish Kingdom, tenth-century China, seventeenth-century India, eighteenth-century Italy and Russia, and nineteenth-century Vienna). (The previous, as a yearbook, also not a bad way to wrap up this chronicle as we approach the year’s end.) Maybe it is appropriate then that Louis, who built the place that Thomas Jefferson would one day call “the pit of depravity,” is the one who left the single most important legacy to the world of architecture: as it was in the beginning, is now and ever shall be, Classicism without end. 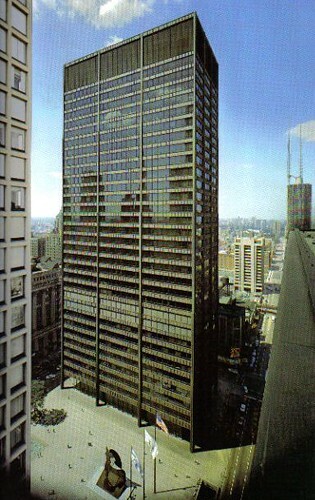 On this day in 1976 the Chicago Civic Center was renamed the Richard J. Daley Center. Daley (1902-76) was The Boss in a town that knows from bosses. His twenty-one year reign as the Windy City’s mayor commenced in those heady post-war years in which faith in increasingly sophisticated technology as a salve to all human ills was steered toward solving the problems of American cities by tearing down and building up at a big, bold scale. The city held the power to name any neighborhood bearing a certain patina as “blight” which could then be bulldozed and either rebuilt to serve the city’s interests or sold off to private developers. (And when we say “city,” of course we mean “Daley,” and you may feel free–hard as it is to imagine Daley speaking French–to picture him stating “la ville c’est moi”). The new Civic Center was one such project among many, including the new campus of the University of Illinois, expansion of Michael Reese Hospital, and the development of huge housing projects at both ends of the economic spectrum (Carl Sandburg Village and Robert Taylor Homes began life in weirdly similar ways). Considering both the new architecture projects and the vast expansion of highways during his terms in office, Daley oversaw more construction than any Chicago mayor since Joseph Medill. His legacy is better judged against such builders as Napoleon III, Julius II, or maybe Trajan, keeping in mind that none of those guys were mere mayors. The Civic Center was conceived as one of those many Modernist fantasies that mark the mid-century boom in Chicago’s architecture, and is certainly one of the more accomplished in that vein. A gridded prism of 648 feet, it eschewed old-fashioned trappings of government symbolism, all bronze glass and Cor-Ten steel (a weathering metal first developed during the Depression to eliminate maintenance on railway cars). The building stood within a broad open plaza, as if it required more breathing room than traditional buildings, or worried that it might, were it positioned too close to its neighbors, catch their cooties. Of course, to make room for this architecture of better hygiene, dozens of germy nineteenth and early-twentieth-century structures had to be demolished (take a look-see what was there). The Civic Center was renamed in honor of Richard J. just a week after his death. He was buried in the Holy Sepulchre Catholic Cemetery, which is regrettable. 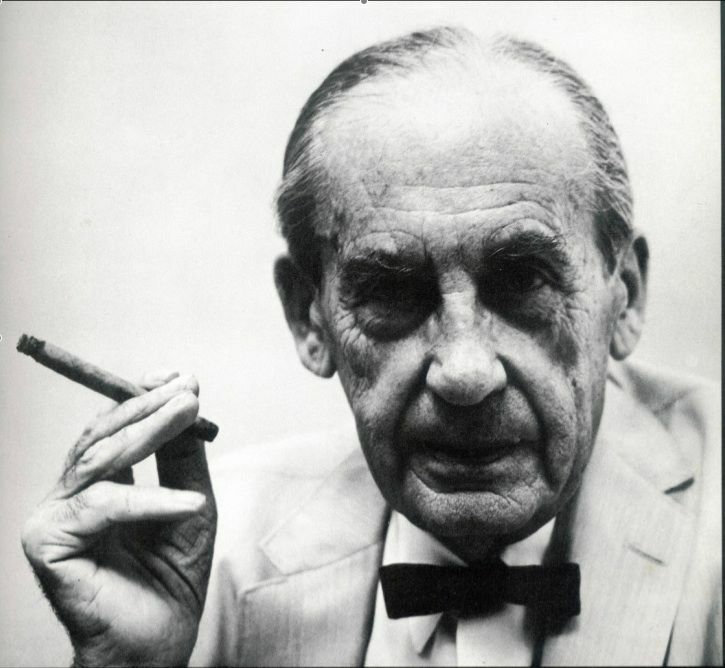 By rights he would have been cremated on a pyre set up in the Circle Forum at UIC and his ashes interred within the building, maybe beneath the Picasso. Then again, maybe that actually did happen, and we have only to wait for Chicago’s answer to Dan Brown to reveal all. On this day in 1867 Sarah Breedlove was born. Born on a Louisiana plantation, she was the first child in her family born into freedom. She spent her life making the most of what that freedom could offer her by taking an unusual route into business. Home experiments to create hair-care products led to the development of a small mail-order business that grew and grew. 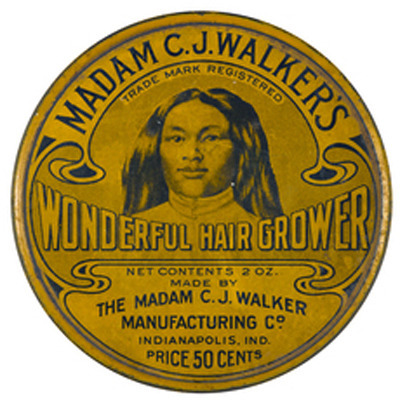 As a businesswoman she became Madame C. J. Walker and eventually a very wealthy woman, regarded by many as the first black female millionaire. Like other tycoons of the Gilded Age, Madame Walker fancied a fancy house. In 1918 she commissioned Vertner Woodson Tandy, the country’s first licensed African-American architect. On a great site overlooking the Hudson River he built the Classically-inspired Villa Lewaro. The grand house features a projecting Ionic entryway flanked by symmetrical wings, from one of which a porte-cochere projected, providing protection for guests who would arrive by auto. Madame Walker only lived one more year after her house was complete, but she is recorded as saying the house was not really for her, but rather meant as a source of inspiration for generations of free African Americans to aim for the success that she herself achieved. 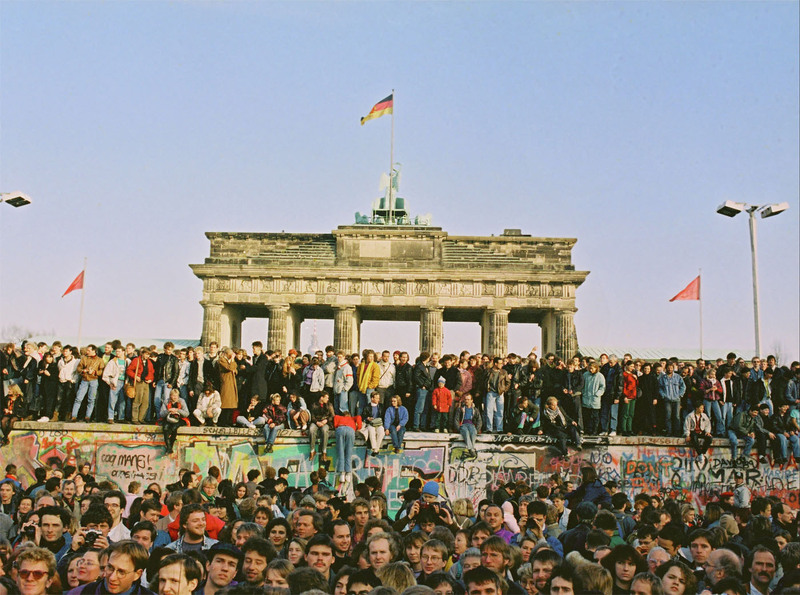 On this day in 1989 the Brandenburg Gate re-opened. The gate was originally the ceremonial and functional entry to the most esteemed thoroughfare in Berlin. 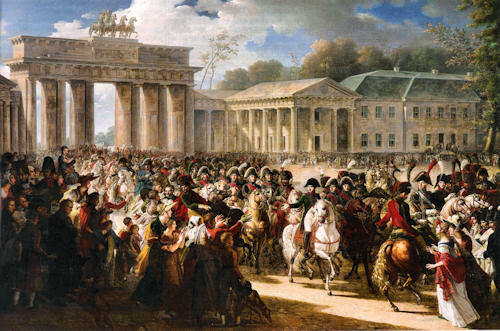 Framing the start of Unter den Linden, which lead to the Prussian palace, the gate was built by Carl Gotthard Langhans for Frederick William II in the years around 1790. As a modern propylaea, the Greek gate provided a proud and noble precedent for the threshold of thresholds. The gate was built in a style–an enduring language of architecture–that provided maximum flexibility as rulers, dynasties, even states, came and went. As the land changed hands, the gate was transformed by a number of different regimes. Among them, Napoleon and Hitler both had their chance to use its universal Greek symbolism for their (albeit short-lived) reigns. Even in these different hands it maintained its role as an opening, until the construction of the Berlin wall. It became, then, a barrier, closed to all traffic in August 1961: the most beautiful element in a monument of formal and political ugliness. With the shifting political fortunes of 1989 the gate attracted the focused attention of all those calling for the removal of the wall; it was their gathering point, their tocsin tower. 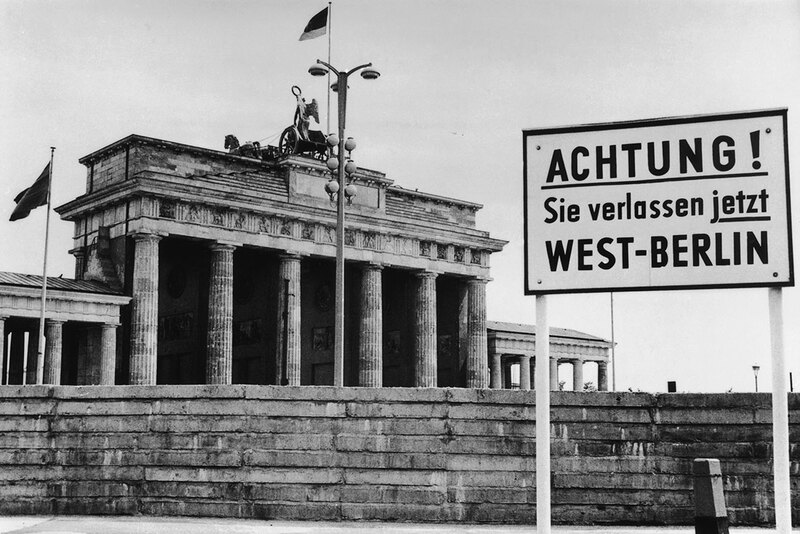 Upon its opening on December 22, the West German Chancellor walked through it to meet East Germany’s Prime Minister. The horrid concrete wall was removed; the Greek gate was restored. 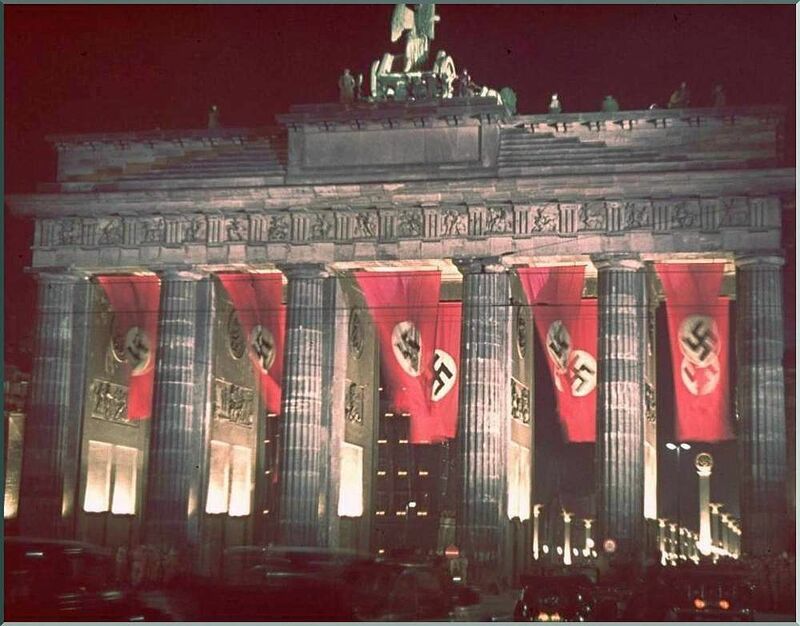 Neither barrier nor entry, it is now a conduit for the unified Germany. On this day in 1850 Lluís Domènech i Montaner was born. The intellectual center of one of the most politically charged Art Nouveau movements in late nineteenth-century Europe, Domènech i Montaner was a practitioner, professor and critic of architecture for over four decades. During that time he built monuments across the Catalandscape (har, har) in the style and spirit of the Renaixença. 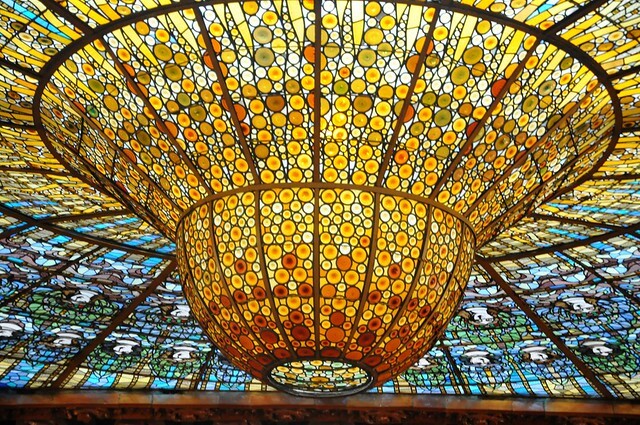 Best among them is the culturally profound and architecturally stunning Palau de la Música Catalana (1908). 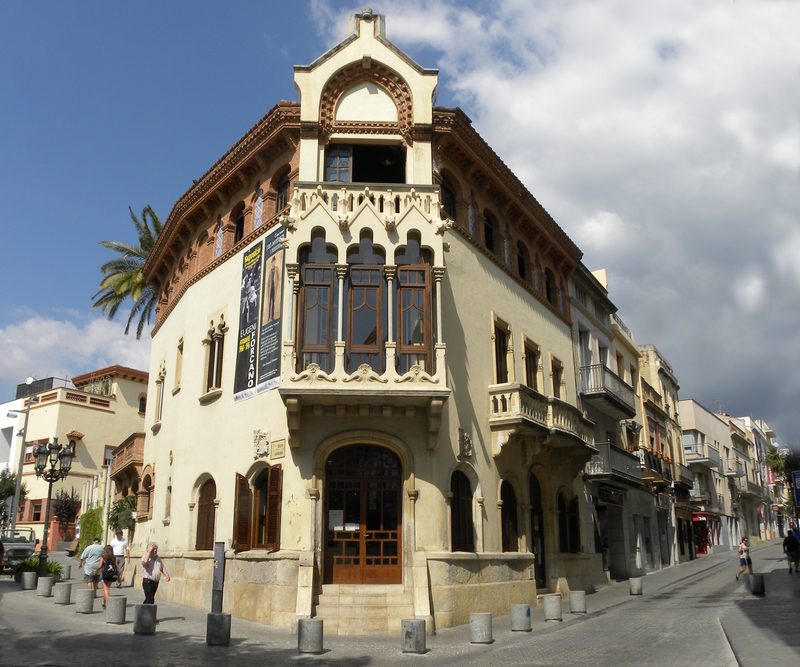 For more extant examples of his brilliant inventive interpretation of Spanish and Moorish traditions in the creation of a new Catalan modernism, brace yourself and see: Ateneu de Canet de Mar (1884), Casa Roura/Ca la Bianga (1892), Palau Ramon Montaner (1896), Casa Thomas (1898), Casa Navàs (1901), Casa Lleó Morera (1902), Grand Hotel in Palma (1903), Hospital de Sant Pau (1905-30), Casa Furster (1911). Biographies of Domènech i Montaner oftentimes mention, tantalizingly, the existence of his writings on architecture going back to the 1870s, suggesting that he was also the primary theorist of the Modernisme movement. 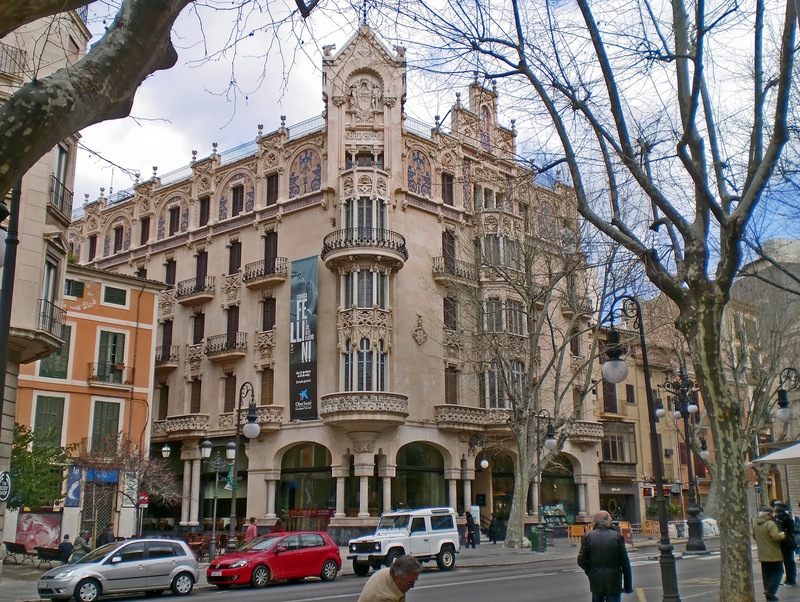 Sadly, this work–rare among Art Nouveau movements overall, with the exception of Otto Wagner in Vienna–remains untranslated from Catalan (which, we understand, is sort of a combination of Spanish, French and Portuguese with a hefty dash of paprika and not just a little finger-waving attitude). Surely that was the appropriate language for these architectural independents, but it narrows the readership of these important works. It appears that scholars who might be able to do the translation are, like most of the world who cares about fin de siècle architecture, so hung up with the more (inexplicably) famous of the Modernisme architects to trouble with them, which is all too bad. Seriously, Catalan speakers: GET ON IT. 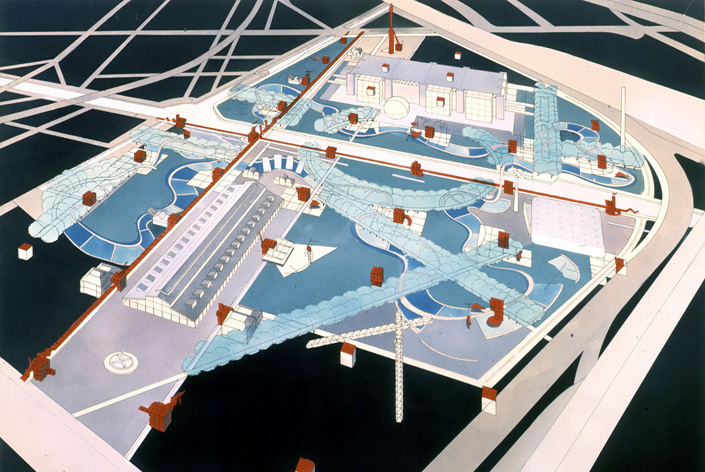 On this day in 1982 the first round of competition for the new Parc de la Villette was coming to a close. The finalists were announced on December 11; on 25 March of the following year, Bernard Tschumi’s design would be proclaimed the winner of the huge international competition that attracted almost 500 entries from around the world. Projected for a 125-acre site reclaimed from former slaughterhouses, the project was proposed as a new kind of park for the twenty-first century, challenging designers to think beyond all those fusty old greeneries with grass and trees and fountains and stuff that people had somehow been getting along with lo these many centuries. 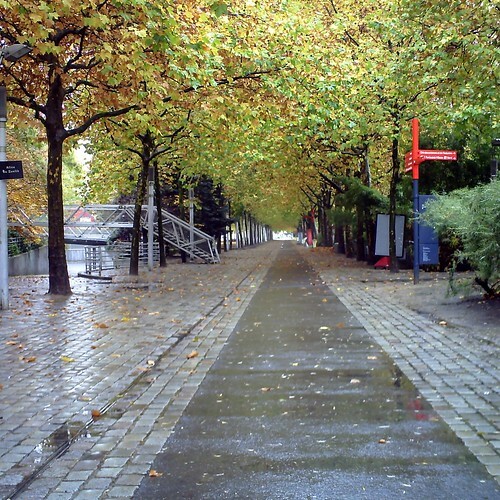 Tschumi’s proposal challenged the paradigm by presenting a park that he claimed was based on “culture” instead of the old-fashioned idea of “nature.” Instead of the cohesive compositions designed with longtime strategies that brought natural features into harmonious design with manmade elements to enhance an outdoor experience–as seen in the Tuileries or Luxembourg for example (which is not, apparently, “culture”)–Tschumi proposed three distinct systems. Conceived independently, the “points” (bright red cubic follies, assigned functions later), “lines” (paths and bridges) and “surfaces” (gravel, grass, paving stones, etc.) were superimposed with a resounding crash that echoed the true tone of the zeitgeist. Indeed, Tschumi portrays the park not as a scattering of buildings across a landscape, but one “discontinuous . . . single structure” (that’s what the website says). On this day in 1986 the Musée d’Orsay opened. The project is a fantastic re-use of a stunner of a train station (designed by Victor Laloux and others in 1898) that had run its course of usefulness (not its fault–the trains kept getting longer). When opened, the station served the newest in transport technology in a building that addressed the longstanding Beaux-Arts traditions in the city, with a stunning, coffered, steel and glass-topped concourse. As of the late 1970s the government decided to change its function to art museum, providing welcome relief to the bursting Louvre. Indeed, the decision was made in the same year that the Centre Pompidou opened; now Paris would have three main state museums, the Pompidou for twentieth-century art, the d’Orsay for art of the mid-nineteenth century through WW1, and the Louvre still stuffed with everything else. Architect Gae Aulenti (1927-2012), who developed her career breathing that cool modernish-classicesque thing that was floating around Italy through the twentieth century, won the competition with her proposal to insert stark, but reticent, gallery prisms into the main concourse. While invading that great big glorious space, at ground level the sweep of the ceiling is still profound, and the galleries serve, rather than overwhelm, the wonderful stuff you go there to see: the Art Nouveau furniture, loads of sculpture, Rosa Bonheur’s cows (seriously, look at the way that white one is looking back at you), Degas from here til Tuesday, and our hands-down favorite, Caillebotte. Like the other two big official art museums (among the gazillion of others crammed into that city), the d’Orsay presents wonderful and delightful paintings and sculpture in an inspiring and complimentary setting. Mon Dieu, Paris knows how to do a museum. You are currently browsing the Twentieth-Century Architecture category at Clio’s Calendar: Daily Musings on Architectural History.